These eye drops contain the antioxidant Carnosine. They are used successfully by dog owners. To help the eye drops work more efficiently, and to assist in getting your pet back to full health and peak fitness, we strongly recommend Lonjevitee L-Carnosine for Dogs, an anti-ageing supplement for as little as £31 for 30g. 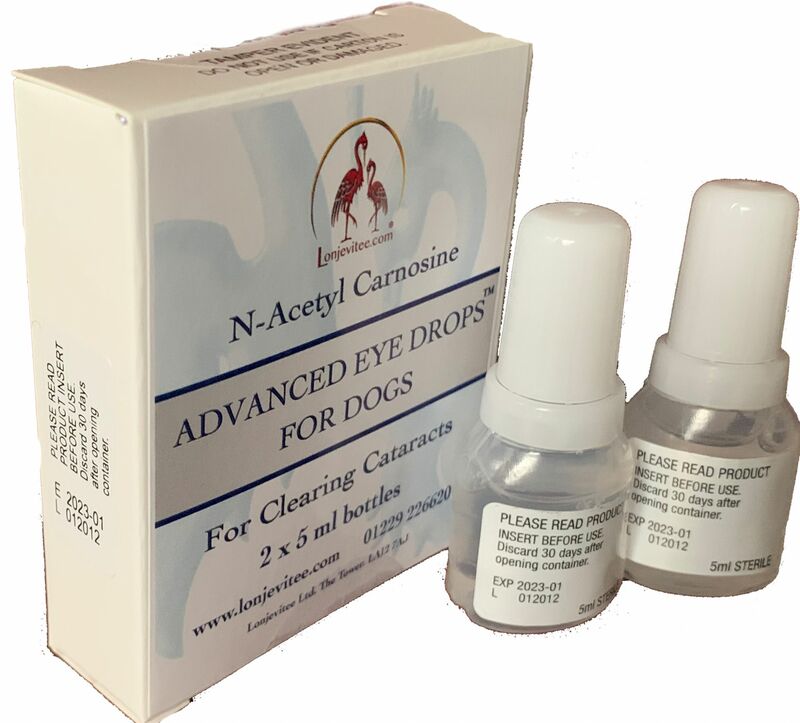 FOR ADDITIONAL INFORMATION ON OUR NAC EYE DROPS FOR DOGS PLEASE CONTACT US. My elderly dog suddenly developed cholesterol deposits on her left eye. The whole of the eye was grey-white. I'd seen this in a Westie many years ago and had no solution for her at that time, now however, I found a solution - I used the Carnosine Eye Drops for Dogs I get from Lonjevitee to help prevent cataracts developing. Her right eye was crystal clear and when I took her to the vet it was agreed that it was indeed what is commonly known as corneal lipidosis or lipid keratopathy. Within a week the eye has cleared to normal. A white milky fluid came away throughout the day and I kept her eye clean and used the drops as often as I could every day. They worked. My dogs have healthy eyes thanks to Lonjevitee. I have to say when I saw the advert in OurDogs newspapers I wad dubious! then I saw a similar advert in a rival paper and decided to do abit of research! Well this was the cheapest place I could find the drops so I thought it was worth a punt! And that it was. This product is 5 stars! I used them on my elderly dog and was pleasantly surprised that the old boy was able to get about independent of me. He's 19 now and he still goes for a walk in the park a few times a week.